LinkedIn provides an interesting array of targeted ad solutions to brands and advertisers. Here is an example of what I discovered. Recently I made a role change in my organisation and see what I found in my LinkedIn inbox. 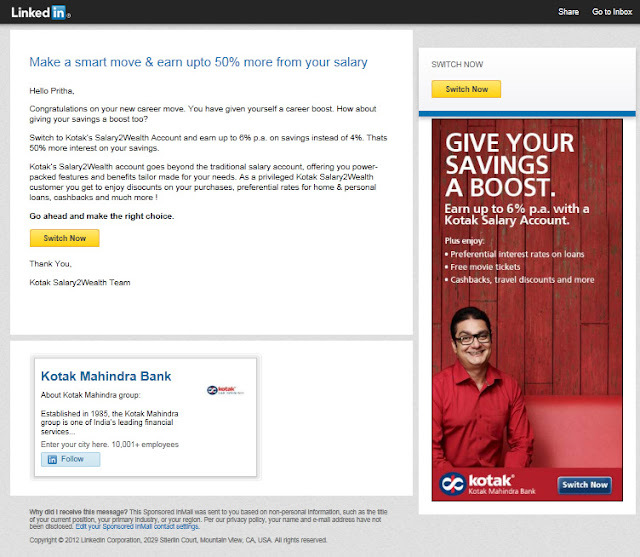 A customised communication from Kotak Mahindra Bank, that referenced my change of roles (maybe even assumed I got a raise! *sighs*) and gives me advice on how I could end up saving more with the available interest rates and incentives by switching to their Salary Account. The personalised one-pager had a link to follow the Kotak Mahindra Bank Group on LinkedIn and a 300x600 prominent ad unit, in addition to (of course) loud ‘Switch Now’ call-to action buttons. Considering the product on point was the KMB Salary Account, I thought the integration was smart and the execution was on point and clean. A great way to generate Qualified Leads by creating relevant communication for your target audience. Would you consider this intrusive?